When I mentioned our goal of making a small oven on top of the wood stove, Roland pointed out that it's essential to do some basic tests first and make sure the stove top temperature is within baking range. Purchasing an oven thermometer in order to make those tests was the real reason we were in the kitchen section of Wal-mart to pick up my meat thermometer turned soil thermometer. The fire brick didn't quite fit into the Dutch oven, so I first tested with the thermometer set on the bottom of the cast iron pot and got a reading of 475 degrees. Figuring a lot of heat was getting conducted from the metal of the pan to the metal of the thermometer, but unable to add in a fire brick because it was too large, I set a pot holder on the bottom of the oven with the thermometer on top. Ten minutes later, a foul stench filled the trailer --- the pot holder had spontaneously combusted. So, unfortunately, I can't tell you whether Mark's idea of cutting down the sides of a 6-pack muffin tin so that it sits on a fire brick inside the Dutch oven will give me temperatures sufficient to bake his favorite sweet treat. Clearly, more experiments are required. Make your own poop-free, homemade chicken waterer in an hour or less. I used to have a metal oven which sat on top of a stove. It was basically a box with a door and a shelf. It baked quite well. Bet they're still around on ebay. Stovetop oven? 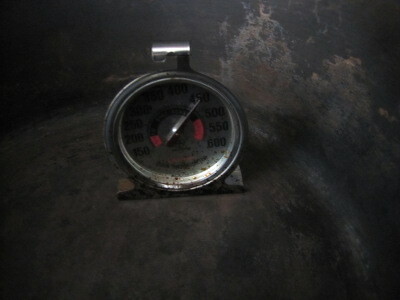 Put a firebrick UNDER the dutch oven, the thermometer inside, and the basin over all. Then, see what temp you get. 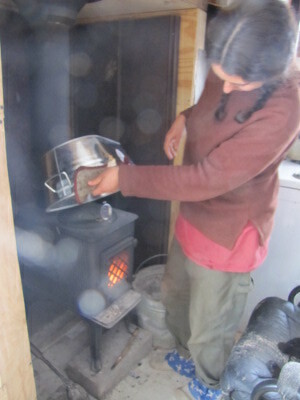 Put the Dutch oven on top of the stove, put a couple of pebbles in it and place the thermometer on top of the pebbles. The relatively small area where the pebbles touch metal should limit heat flow through the pebbles into the thermometer. The same technique should work for a muffin tin, I imagine. Look at some marine ovens for on top of heating stoves. Most are just a box single or double wall, and have been working well in many sailboats for generations. Small jotel's have been used to cook on and provide heat for quite some time. The best thing is experience as you'll rarely get the same temperature two times in a row with a wood fire. Anonymous --- That's a good idea, although I'd think it would be considerably cooler than the temperature if I put the thermometer on a piece of fire brick inside the Dutch oven. Galvanized metal isn't safe for cooking. . .
Just wanted to mention that the galvanized tub might give off poisonous fumes when heated on the woodstove. Folks probably already know it's unsafe to cook in directly, but I bet it's also unsafe to breathe fumes from it when heated. Please check into this. Maybe Roland can answer this? What do you think, Roland, would galvanized metals give off enough fumes that they'd make food cooked underneath unsafe?